SAN JOSE, Calif. (AP) — Facebook wants you to sit in your bedroom wearing a headset and take a virtual vacation with faraway friends and family. Or use your smartphone's camera to spruce up your dinky apartment, at least virtually. 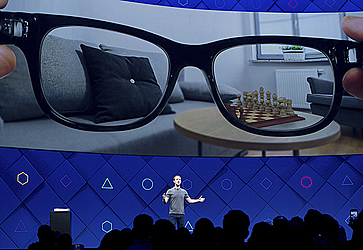 The promise of augmented and virtual reality was a big focus of Facebook's annual conference for developers on Tuesday. CEO Mark Zuckerberg kicked off the gathering of programmers and other tech folks by talking about augmented reality tools he envisions on Facebook. Facebook executives stressed that the technology is still in its early stages, and that the "journey to the future of augmented reality is just one percent finished," as Deb Liu, vice president of platform and marketplaces, put it. Facebook also launched a virtual world, called Facebook Spaces, designed to let users of its Oculus Rift VR headset hang out with their friends wherever they might be. It's the first time the company has connected the Rift to its social network in a meaningful way, though it's a development Zuckerberg hinted at when the company bought Oculus back in 2014. The Facebook founder also briefly addressed a tragedy that took place Monday, when a man posted video of a murder on Facebook. That raised questions about the company's ability to monitor gruesome material on its site. Zuckerberg said Facebook has "a lot of work" to do on this front.